Holidays are hectic in my family. This Easter, Brad and I celebrated together. There was relaxation! There was no running around like a chicken with your head cut off! It was great! I came up with a pretty good and simple menu. The ham steaks was the easiest (and yummiest) part. Place a ham steak in a piece of tin foil. Top with pineapple, mashed sweet potatoes and brown sugar. Wrap up and put in a 350 degree oven for about 15 minutes. Remove the steak and top with mini marshmallows. Do not seal back up! Pop back in the oven for another 10 minutes or until the marshmallows are brown. Turnip greens were quite yummy. Cook some bacon and sauteed the onions in the bacon fat. Add the turnip greens and wilt. Serve warm! I had turnip greens in my CSA box. i looked at it and thought, “what in the world am i going to make with this?” i’ve never used turnip greens. after taking a peek around epicurious.com, i found this and thought it was simple enough to try. i ended up using just ham because i didn’t want to go through the hassle of buying a ham hock – yes, i’m lazy. it still turned out wonderfully delicious. so delicious i convinced my mom to let me bring some (sans ham) for thanksgiving dinner. i read in the comments section that this dish is best the next day and it was true. it was even more wonderful! 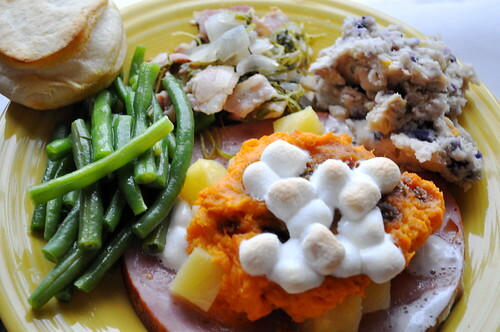 with this in mind, it will be a cinch to make for thanksgiving since i can do it the day before. 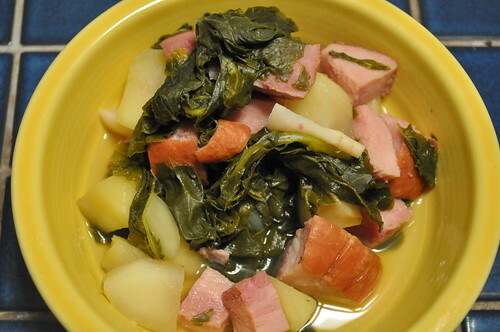 i will be using WAY more turnip greens to make it a substantial side dish. this dish was silky and buttery and i really can’t wait to eat it again. *photo doesn’t look so good but believe me, it was yummy. 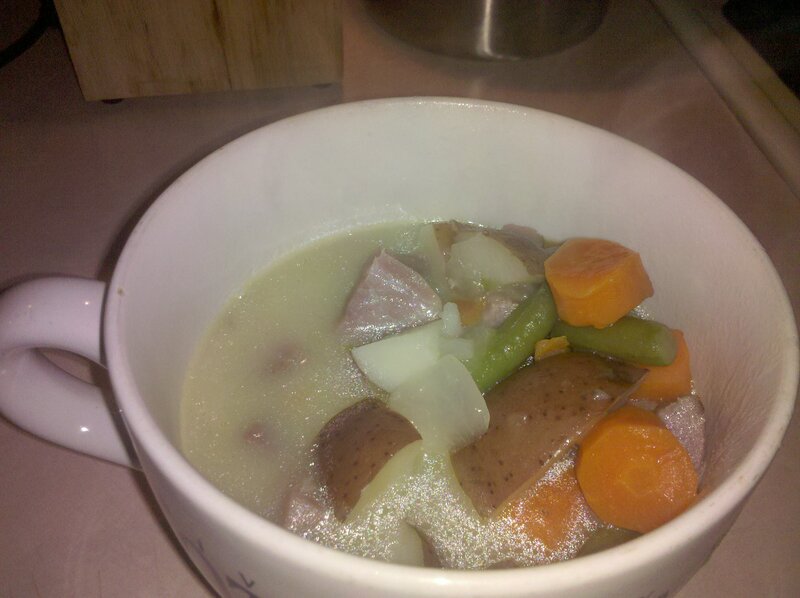 Since we’re snowed in courtesy of “snopocalpse” I decided to finally make that ham and veggie soup I’ve ben wanting to make. You can use how much or little veggies you’d like. This is what I had on hand. In a stock pot pour in chicken broth and water. Add ham, carrots and onions and bring to a simmer. Cook until veggies are tender. Add the potatoes and cook until the potatoes are tender. Add the green beans and bring to a boil. Add roux and let the soup thicken (and so the flour taste of the roux disappears). Serve. This is also a soup that is great after it sat in the fridge for a day or two. I definitely have some leftovers to keep me warm while the snow is still here. Thank you, mom, for giving me loose directions to make this soup. Now it is my own.